FEMA expects a major earthquake in the central United States to be the costliest natural disaster in American history, which as a California tech worker wounds my professional pride. We've spent decades building America's most valuable industry on top of a seismic powder keg, only to find ourselves outdone by a bunch of Midwestern cotton farmers. How could they erect a more precarious house of cards than Silicon Valley? To find out, last spring I joined a group of Midwestern geologists and fellow-travelers on a sort-of-annual field trip to the New Madrid Seismic Zone. The goal of these trips, organized by Phyllis Steckel of Earthquake Insights, is to develop an eye for the kinds of structures and landscapes at greatest risk in a central US earthquake, to soak up the seismic ambiance of the place, to take killer ‘before’ pictures for when the Big One comes, and above all to put the fear of God into actuaries and insurance assessors, the only people who have enough economic leverage to make painful and expensive seismic retrofitting happen in the central United States. The New Madrid Seismic Zone earned its reputation on the strength of three massive earthquakes that struck in the winter of 1811-1812. The region was very sparsely settled at the time, and became more sparsely settled immediately afterwards, as anyone with legs made it their life's mission to get out of southern Missouri. By the time people came back in any numbers, whatever angry forces drive the quakes had gone dormant again. On the 16th of December, 1811, about two o'clock, A.M., we were visited by a violent shock of an earthquake, accompanied by a very awful noise resembling loud but distant thunder, but more hoarse and vibrating, which was followed in a few minutes by the complete saturation of the atmosphere, with sulphurious vapor, causing total darkness. The screams of the affrighted inhabitants running to and fro, not knowing where to go, or what to do—the cries of the fowls and beasts of every species—the cracking of trees falling, and the roaring of the Mississippi—the current of which was retrogade for a few minutes, owing as is supposed, to an irruption in its bed—formed a scene truly horrible. The 16th December earthquake, by the best modern estimates, was a magnitude 7.5 event. It was followed by at least ten thousand aftershocks. 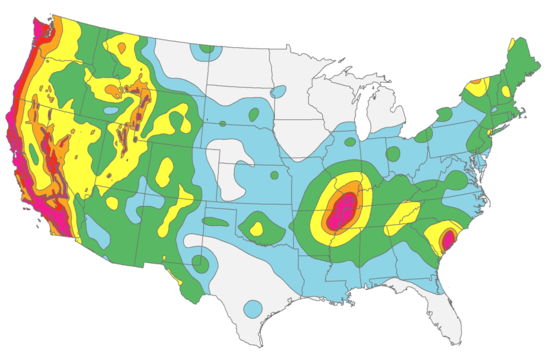 An observer near Louisville, Kentucky (380 km from New Madrid) recorded over two thousand earthquakes in the period following the first quake, including at one point “almost continuous shaking from 8 AM to noon”. One of the odder problems in New Madrid seismic historiography is that people got so used to the earth trembling like jelly that they simply stopped recording the smaller earthquakes. The final and strongest shock hit on February 7th, a 7.6 magnitude quake centered very near the Mississippi river town of New Madrid. At first the Mississippi seemed to recede from its banks, and its waters gathering up like a mountain, leaving for the moment many boats, which were here on their way to New Orleans, on bare sand, in which time the poor sailors made their escape from them. It then rising fifteen to twenty feet perpendicularly, and expanding, as it were, at the same moment, the banks were overflowed with the retrogade current, rapid as a torrent—the boats which before had been left on the sand were now torn from their moorings, and suddenly driven up a little creek, at the mouth of which they laid, to the distance in some instances, of nearly a quarter of a mile. The river falling immediately, as rapid as it had risen, receded in its banks again with such violence, that it took with it whole groves of young cotton-wood trees, which ledged its borders. They were broken off which such regularity, in some instances, that persons who had not witnessed the fact, would be difficultly persuaded, that is has not been the work of art. A great many fish were left on the banks, being unable to keep pace with the water. The river was literally covered with the wrecks of boats. It took a while for the aftershocks to settle down, but with a single exception (a 6.8 quake on Halloween, 1895 at Charleston, Missouri that cracked chimneys in St. Louis and Memphis) there has been no damaging earthquake in the New Madrid Seismic Zone since. Two hundred years later, despite great advances in our understanding, we still have no idea why there are earthquakes here, or any way to answer the three-hundred-billion dollar question: how likely is it a major New Madrid earthquake will happen again in our lifetime? Over long enough time scales, of course, everything is doomed. From a major earthquake in California, to a repeat of the 1700 Cascadia earthquake that will obliterate Portland or Seattle, to more exotic but equally inevitable threats like giant solar flares, there is a deep bench of natural disasters waiting to wreak havoc on the United States. New Madrid is interesting because of the degree of uncertainty it represents. It belongs to a class of earthquakes we don't understand and whose mechanisms are obscure. The historical evidence is unequivocal that there are strong, recurring earthquakes in places far from tectonic plate boundaries—not just New Madrid, but New Hampshire, Quebec, Boston and South Carolina. But we don't know enough about them to quantify the risk. Half the country sits on a powder keg, but there's no telling how long the fuse is, or whether it's even lit. 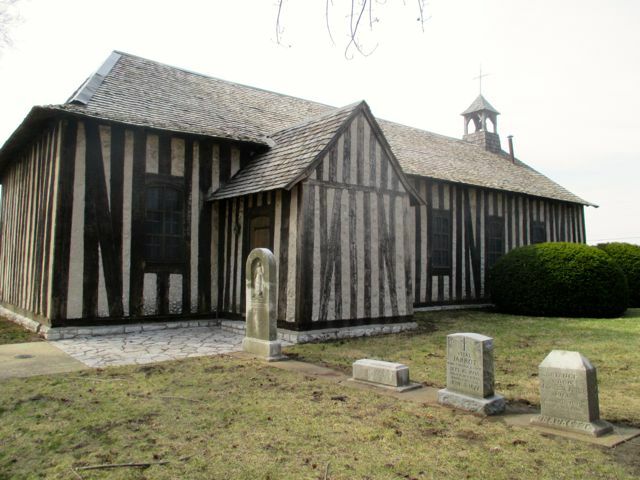 An email tells me to rendezvous with the group in front of a little church not far from St. Louis, one of the only existing structures to have survived the 1811-12 earthquakes. St. Louis itself is a beautiful city, but the country across the river is a wasteland. Grain silos and industrial buildings, some active and some abandoned, line the waterfront. Facing the St. Louis arch is a large casino, a windowless Arby's-like building designed by someone who was wronged by architecture as a child and never found the strength to forgive. Beyond the casino lies the urban disaster of East St. Louis. Cahokia is a couple of miles to the south, an indistinguishable grid of streets embedded in a landscape of parking lots, pawn shops and dollar stores. Nothing about it suggests that it's one of the oldest settlements west of the Appalachians. I spot a group of geologists with rucksacks standing in front of an unusual, striped structure of plaster and wood. Growing up in Illinois filled me with such a longing to escape that it's hard to imagine someone wanting to live here. Yet here before my eyes is a building made by people—French people—who thought the idea worth celebrating; for whom Illinois was the perfect place to stop and settle for a while, and maybe build something sturdy. The original church was built in 1699. A hundred years later, it was disassembled and the beams reassembled into the larger structure that stands here today, a slightly trapezoidal building whose dark vertical beams alternate with areas of plaster. The wood has long ago transcended its vegetable origins and become something resembling stone. The church caretaker tells us that the last time they needed a hole drilled in one of the beams, the contractor ended up chewing through four drill bits and using vocabulary never before heard within its sacred walls. Each of the massive beams has been valued at twenty-five thousand dollars in theory. In practice, they are irreplaceable. The huge trees they were hewn from are long gone, part of a vast forest that was the first casualty of European settlement. While it doesn't feel like we're much above the river, the church stands just high enough to have escaped flooding for the past three hundred years, no mean feat on the Mississippi, though at times the water lapped against the doorsill. The New Madrid earthquakes didn't even crack the plaster. Cahokia's second-oldest building, the Jarrot Mansion, stands a few dozen meters to the west. Nicholas Jarrot was a Montgomery Burns-like figure who dominated the region in the early 19th century. Like in a Biblical parable, his gorgeous brick mansion didn't fare as well as the homely church when the ground shook. Jarrot was guilty of one of the greatest seismic sins, building with unreinforced masonry (sometimes abbreviated URM). Brick walls withstand compression but have almost no shear strength. Unless reinforced with bracing or steel rods, masonry will tumble like a stack of sugar cubes during any prolonged shaking. The Jarrot Mansion has since been rebuilt and stands waiting to be destroyed by the next quake. The squat little church, designed for the worst a Norman climate can throw at it, will probably outlive humanity. In the church parking lot we rendezvous with a car and van from Northern Illinois University, up in DeKalb. The passengers have the haunted, vacant look of people who have just taken an Illinois road trip. Their arrival brings our cohort to thirteen: five geologists, a geodynamicist, a professor of emergency management and one of his students, three graduate students in geology, a geographer, and me. Phyllis hands out our trip packets and gives us directions to our stop for the night, the town of Chester, Illinois, fifty miles to our south. Lacking a bus, we agree to rotate across cars and vans so that everyone has a chance to chat with one another. The group is gratifyingly tolerant of the geologic novices in their midst, but there are moments during the next few days when I feel distinctly out of my depth. Not a dozen miles out of Cahokia, our front passenger points at a row of low hills and says, with a big smile on her face, “Karsty!”. The car shakes with laughter. Chester is home to a maximum-security prison, a maximum-security mental institution, the Gilster flour mill, and E. C. Segar, creator of Popeye the Sailor Man. The town elders have weighed their options and decided to promote Popeye. There are little statues of him, Olive Oyl and Bluto throughout town. The garbage cans are oil drums painted to look like cans of spinach. We settle into a chain hotel with a handsome Greek collonade and assemble in the lobby that night for a briefing about central US earthquakes. Unbeknownst to us, at that very moment a magnitude 2.2 quake is ripping through New Madrid. Phyllis breaks out her powerpoint deck and briefs us on the oddities of Midwestern earthquakes. The first thing to know is that earthquake energy propagates much farther in the central United States than it does out West. Living in California, I always attributed this to Midwesterners being a more seismically sensitive people, perhaps due to their vast bulk, but the difference is a matter of objective fact. Bedrock east of the Rockies is older, colder, more rigid, and (to use the lovely term of art) more competent than the shattered pile of rubble under California. This rigid Midwestern rock transmits energy efficiently across long distances. The Berkeley seismic blog shows a lovely example of how much farther an earthquake of similar energy is felt in the central United States. Shaking intensity for 2011 Oklahoma quake, M 5.6. Shaking intensity for 2007 Calaveras earthquake, M 5.4. Maps are to same scale. Phyllis stresses the distinction between magnitude and intensity. Magnitude is the measure of total energy released in an earthquake, a single (large) number that we cannot directly measure. Intensity is what we feel on the surface, and it is sensitive to distance, soil type, local geology, how deep the hypocenter was, and many other factors. Since 1999, the USGS has been running a structured online questionnaire called 'Did you feel it?' that lets them collect very specific data about intensity for earthquakes. Although it uses subjective reporting by untrained observers, the reports correlate well with more objective measures of intensity, like ground acceleration, while providing far wider coverage. 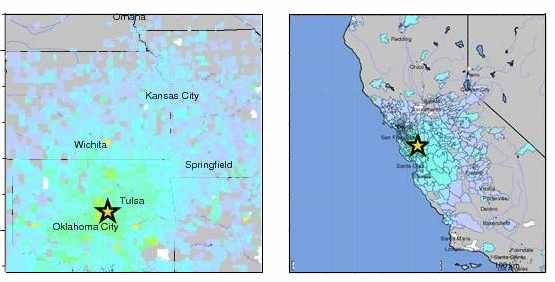 The second big fact about Midwestern quakes is that sediments amplify shaking. The rigid bedrock that transmits all that seismic energy lies under a deep blanket of mush laid down by the great Midwestern rivers. Just as tsunami waves will slow in speed but grow in amplitude as they enter shallower water, seismic waves slow and amplify in the kinds of alluvial deposits that cover much of the central US. The sediment filters out high-frequency components, but amplifies the kind of low-frequency waves that can shake buildings apart. Christchurch, New Zealand comes up a lot in Phyllis's talk. Both the geology and types of buildings there are very similar to what exists in the American midwest. This makes me uneasy, as I've just been to Christchurch and wandered through the condemned central business district, block after block of seemingly intact buildings that are nevertheless abandoned and completely uninhabitable, waiting their turn for an overworked and overwhelmed local government to tear them down. Christchurch is a good example of why earthquake magnitude isn't the whole story. While the terrible second quake in 2011 was "only" a 6.3, the peak ground acceleration in some suburban areas was over 2.2g—in other words, the ground shook hard enough to throw people in the air. Much of the sewer system rose toward the surface due to soil liquefaction, like a zombie rising from the earth, and became unusable. You can still see above-ground PVC pipes running along roads in Christchurch as a makeshift replacement. Because of these two factors—sediment amplification and how far earthquake energy can propagate-models of earthquake damage in the NMSZ are not very sensitive to where the earthquake is centered. The NMSZ covers a fairly large area, but an earthquake anywhere along the fault system (or in the nearby Wabash seismic zone) would devastate the region. 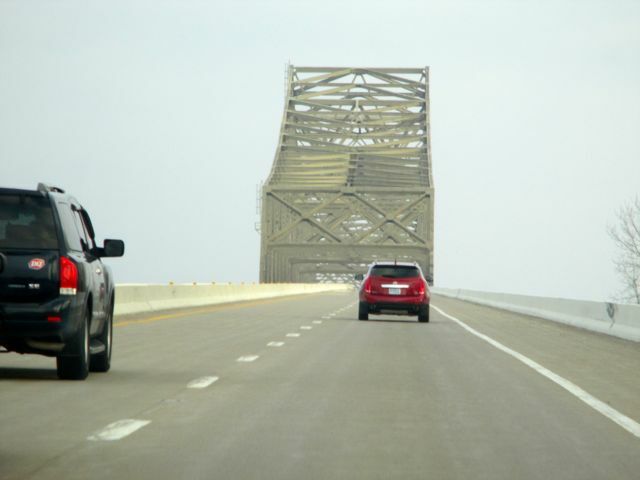 The next morning, we cross the Mississippi over a highway bridge that has been carefully anchored in rock on the Illinois side and propped up on a sand berm on the Missouri side, possibly to make life easier for lazy writers searching for a metaphor. It's a truism that in earthquakes, structures tend to fail at the connection points, and this holds for abstract political structures just as much as highway bridges. The New Madrid Seismic Zone sits at the junction of seven states and four FEMA districts. As far as the authorities are concerned, there's no center here, only periphery. When the big earthquake comes, eleven large bureaucracies, along with the Army Corps of Engineers who mind the river, will have to coordinate efforts in an atmosphere of chaos and scarcity. Our first stop past the river Kaskaskia, the former capital of Illinois. A change of bed by the restless Mississippi has left it stranded as an exclave on the far side of the river. The town has a Missouri ZIP code, but the Illinois Department of Transportation comes over the bridge to fix potholes. Kaskaskia was completely submerged in the flood of 1993, which didn't improve its chances of bouncing back as state capital. Thirty-three people were still living in the village before the flood; only nine decided to move back afterwards. The place is rather eerie. There are no signs of life, but the buildings are tidy and there are several parked cars that suggest a human presence. A sign on the pecan tree asks us to please not pick the pecans, as they belong to the local church. 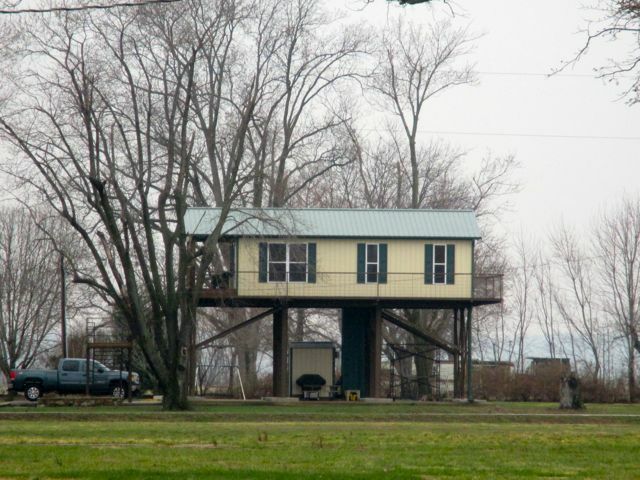 One of the remaining residents, perhaps responding to a flood insurance requirement, has elevated his trailer on cartoon-like stilts. Phyllis looks them over and frowns at the lack of adequate cross-bracing. This structure would fall right over in a quake. Everyone's got their own disaster in mind. If the profession of engineer were not based upon exact science, I might tremble for the result, in view of the immensity of the interests dependent on my success. But every atom that moves onward in the river, from the moment it leaves its home among the crystal springs or mountain snows, throughout the fifteen hundred leagues of its devious pathway, until it is finally lost in the vast waters of the Gulf, is controlled by laws as fixed and certain as those which direct the majestic march of the heavenly spheres. Every phenomenon and apparent eccentricity of the river—its scouring and depositing action, its caving banks, the formation of the bars at its mouth, the effect of the waves and tides of the sea upon its current and deposits—is controlled by law as immutable as the Creator, and the engineer need only to be insured that he does not ignore the existence of any of these laws, to feel positively certain of the results he aims at. We have learned to rue making statements like that in the century since. Sometimes knowing the rules doesn't get you far. Stokes and Navier formulated the equations governing moving water in 1822, but there's still a million dollar bounty waiting for the first person who can make them tractable. Those heavenly spheres turn out to be far more predictable in their motions than the smallest trickle of water. 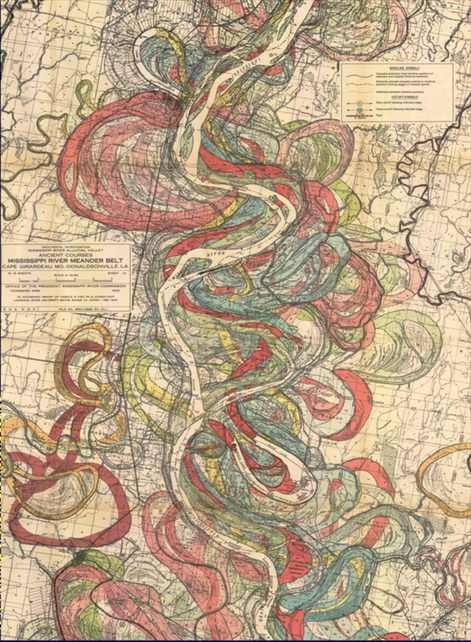 Randomness and chaos are built too deeply into the natural world for us to make any headway against the Mississippi. Our efforts to model the river have worked about as well as efforts to contain it—mostly successful, but spectacular when they fail. 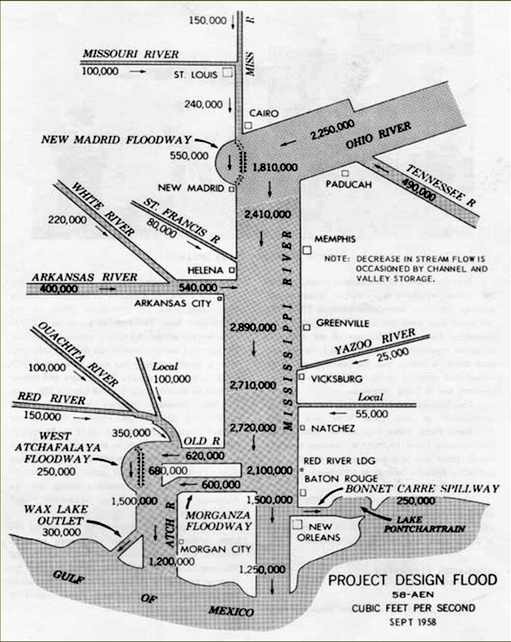 The levees on the river are built to a master plan called the 'project design flood', a Frankenstein monster of past flooding events stitched together into a hypothetical three-day storm with the enchanting name 'Hypo-Flood 58A'. The project design flood is supposed to represent the worst imaginable flooding incident that could occur in the watershed. Nature has had fun with the project design flood. Everyone still remembers the five-hundred-year flood in 1993, which was the biggest flood since the one in 1827. Then there was five-hundred-year flood in 2008, followed by the five-hundred-year flood in 2011. Given the frequency of these five-hundred-year floods, you can hardly fault the model for failing to keep up. For all our high-tech visibility into the Mississippi watershed, we find ourselves constantly filling sandbags. If that's the situation on the surface, where we can see the water moving and know all the rules, you can imagine how much worse it gets underground. In places like California or Seattle, we pretty much understand why earthquakes happen. Adjoining tectonic plates try to slide past each other, or under one another, and snag like rough skin on silk. Wherever one of the snags let go, there's a little release of pent-up energy, an earthquake. The bigger the area that ruptures, the more powerful the shaking. We know the relative motions of the moving plates (nothing makes a science writer happier than to remind you that Los Angeles is moving towards San Francisco at the same speed your fingernails grow), and by sticking sensitive GPS devices into the ground we can even measure the accumulating strain. But this is a fundamentally kinematic, not dynamic, description of the world. We talk about motions without being able to explain the underlying forces. The most basic questions about plate tectonics remain open. What is the motor pushing these restless plates around? Are they being pushed or pulled? Why do they move at different speeds, and sometimes abruptly change direction? What causes the hot spots that seem to stay motionless for hundreds of millions of years while tectonic plates slide above them? When it comes to intra-plate earthquakes, unfortunately, there's no substitute for understanding the "how". The nearest plate boundaries are thousands of kilometers away, so it is not obvious what mechanism could be putting strain on the faults. These are zones that, according to our theories, should be seismically dead. And yet the earth moves.